Learn how the Market Matrix cycles can transform the way you trade and help you to become confident whenever you enter the market. Once you learn how to use the cycles correctly, it is unlikely that you will ever look at a stock chart again without thinking about where price is in relation to the Matrix Cycles. What is the Market Matrix? Beginners and sometimes even professionals face difficulty in identifying the end or beginning of a new trend. Very often, by the time a trend is identified, most of the price movement has already occurred. Thus, in practical terms, even the best traders find it hard to capture more than 60% of a rising or declining trend in the price of an asset. Of course, most traders capture far less than this or even lose money because they enter at exactly the wrong time, very often just as the trend is ending. Now, imagine if there is a trading system or software product which could enable you to precisely identify where the end or the beginning of a new trend will take place. A trader with a good understanding of such a system would be able to enter and exit much earlier than others, and with a much higher degree of confidence, thereby maximizing their potential gains. The Matrix Matrix is one such tool which enables the analysis and an accurate forecast of an iminent change in the trend of any stock, index, commodity or currency pair. A more detailed explanation of the cycles and details of where to buy the Matrix add-on software follows but this Market Matrix Cycles video will also give a trader/investor a very good basic introduction to the subject. Before we discuss what Market Matrix cycles are all about, it is better to have a quick background understanding of Delta trading strategy. A theory originally devised by Jim Sloman, he discovered that within a given time frame, all assets traded in the financial markets form repetative cyclical patterns with approximately the same number of major high and low turning points. By extending these Delta turning points into the future, a trader can forecast with reasonable accuracy the timeframe at which point a trend change will take place in a market. Jim Soloman passed the discovery of these cycles on to Welles Wilder, the creator of RSI (Relative Strength of Index) - a popular technical indicator, who explained the discovery in his book, The Delta Phomenon. Now, coming back to the Market Matrix cycles, after further analysis of the Delta theory, the Matrix creator Steve Copan came to the conclusion that there were some fundamental errors with Delta and further developed the theory, discovering additional cycles on other time frames, and fine tuning the system for determining the turning points. A good understanding of Market Matrix cycles, coupled with additional technical analysis studies taking other technical indicators into consideration, such as Fibonacci time and price retracements, and Elliott wave theory, can lead to pinpointing the turning points with a remarkable level of accuracy. Any cycle can be defined as a series of events which repeat in the same order. A calendar cycle, for example, comprises of 12 months beginning 1st January and ending 31st December. Within a calendar cycle, there are repetitive events such as change in seasons (spring, summer, autumn and winter). These events are referred to as points within a cycle. As the calendar cycle repeats, these events are bound to occur again and again in the same order. A balanced up and down movement within these cycle points will look as shown in the image below. For quick reference, a numerical representation of the events can be plotted as well. Being a repetitive pattern, predicting one or all of the events or turning points in the next cycle should be an easy task for anyone. Now, what is very important to remember is that according to Steve Copan, there is also a possibility of an extra point before, afte,r or on either side of the first point in a new Matrix cycle. This extra point is referred to as an inversion point. The inversion point alters the high or low of the subsequent turning points, as can be seen in the images below. However, the important thing to consider is that based on whether the point 2 is a high or low in a cycle, the rest are not interchangable and can therefore be used to enter and exit trades with a very high degree of confidence. So far, we have only discussed a simple cycle, which has a fixed length of time with set points or events within it. Now, let us turn back to the Market Matrix cycles which are slightly different. Earth cycle – Time taken (Julian year - 365 days) by earth to complete one revolution around the sun. Lunar cycle – A lunar year of 12 synodic months (354 days - 11 less than physical earth cycle). Single day – One rotation of earth around its axis (360 degrees). Four days – 1440 degrees completed by earth’s rotation. MCI Matrix Cycle: 4 days in length This is the shortest of the Matrix cycle and is of 4 days in length. 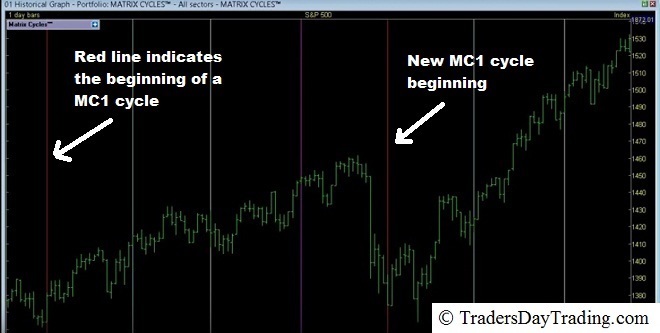 MC0 Matrix Cycle: 4 weeks in length Being extremely short time periods, both MCI and MC0 cycles would only be of practical use for day traders. MC1 Cycle: 118 days in length This equates to 4 lunar months or 120 degrees of a lunar year. Additionally, the MC1 cycle can invert and has 11 matrix points. MC2 Cycle: 1 lunar year in length 12 lunar months or 354 days of earth days. This cycle can also invert and has 12 matrix points. MC3 Cycle: 4 years in length 16 seasons or 1461 days – one calendar day added to include a leap year. The cycle can invert and has 18 matrix points. The important point to remember is that there will be a compulsory double inversion if the MC3 cycle inverts. MC4 Cycle: Also 4 years in length 4 years or 1461 days and is commonly referred to as a business cycle. There are 8 matrix points and it never inverts. MC5 Cycle: 19 yrs and 5 months This matrix cycle will never invert and is 1 metonic cycle in length – a straight line interaction of sun-moon-earth interaction. The mc5 cycle has 16 matrix points. MC6 Cycle: 76.6 years in length The MC6 Market Matrix cycle is 76.6 years long, roughly equating to the average human expectancy and has 18 matrix points. Only a double inversion is possible. The length of the next cycle is 304 years. Thus, it is not practical to look into cycles beyond MC6 since there is a lack of data to analyze. However, it should be remembered that there are cycles, which run for millions of years. There are some basic rules governing the identification of points in all the matrix cycles. 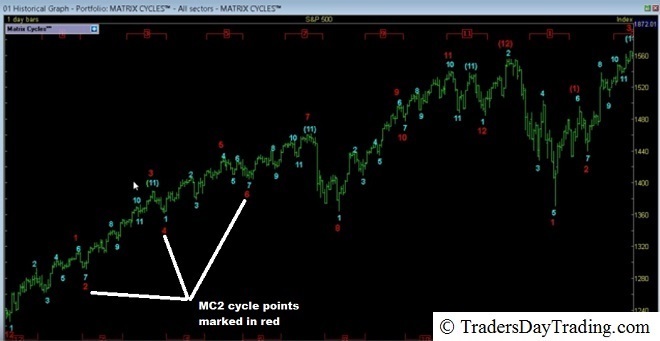 Once a trader understands how to plot the points in MC1 cycle it would become easy to proceed in the same manner in the next higher cycle. The MC1 cycle can be identified with clarity in a daily chart. On average there will be only up to three (out of the 11) individual Matrix points within each quarter of MC1 cycle. The MC1 points can occur three to four days earlier or later relative to their average position. In indices, the point 1 usually forms around the beginning of the first quarter of a cycle, near the Red line in the Matrix grid. 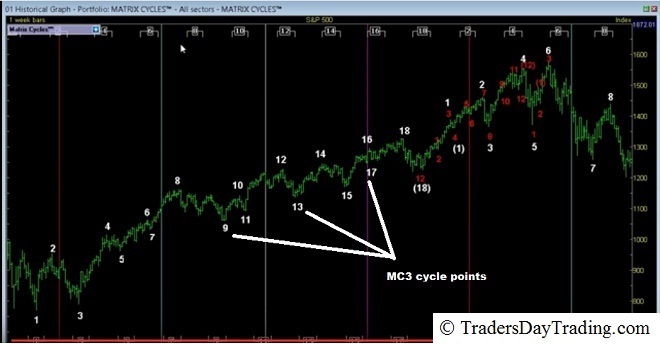 In the case of commodities and currency pairs, the first MC1 point tends to develop elsewhere in the cycle (plus or minus 60 days – white line in the chart shown above) and around the end of second quarter of MC1 cycle in the case of precious metals. The completion of MC1 point 11 paves way for the beginning of the next MC1 cycle. However, the point 11 can develop a little earlier thereby giving time for an intermediate turn before the formation of point 1 of a new MC1 cycle. This additional point is referred to as an inversion point, represented by a number shown in brackets. 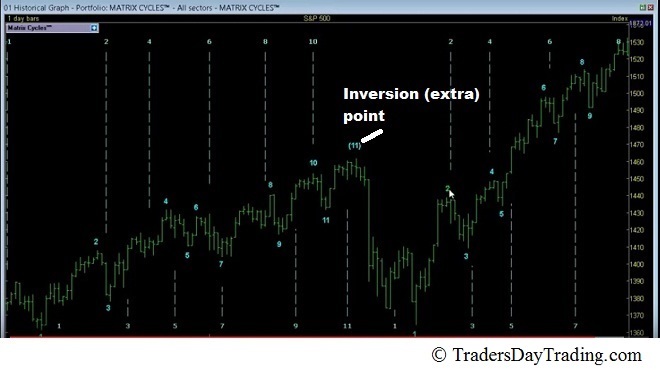 The exact timings of points 11, 1 and 2 can be affected by the appearance on an inversion point. eg: when point 11 comes early, it may be an indication that there is likley to be an inversion (11) before point 1 forms. To identify where the exact average position of a matrix point is, there will be a need to study at least 8 MC1 cycles where possible. Big price moves are usually seen near point 1. Thus, a trader can easily look for this volatility to quickly identify where point 1 is most likely to be. In a similar way as can be understood in Elliott wave theory, there will always be small and big price moves within a cycle. This can be explained by the fact that a price movement (in the MC1 cycle) which syncs with the primary trendy (Elliott impulse wave), or higher matrix cycles – MC2, will result in an overall bigger price movement. On the other hand a corrective wave price movement which tries to defy the primary trend in the higher cycle (MC2), will be a smaller one. It can be safely argued that as long as the MC2 cycle is up, each and every matrix point in the MC1 cycle will be higher than the previous one respectively, and vice-versa in a down trend. If the uptrend in the MC1 cycle coincides with a downtrend in a MC2 then the resulting high or low MC1 point will be below the previous high or low MC1 point. Only those inversion moves that may happen at the beginning of a MC1 cycle can be an exception to this rule. It is often the case that an inversion point will occur whenever a turning point of the larger cycle is due. In this case when and MC2 point is due it is likley to take place in sync with an inversion in the MC1 cycle. Around the inversion zone, price may not move in tandem with the higher cycle (MC2) point. An inversion point causes confusion for market participants and triggers wrong entries so traders should take care as it is often very difficult to ascertain as to whether an inversion has taken place or not until the next point is in place. Visually, a trader will not only be able to see the formation of higher highs and higher lows but also the contradictory move as shown in the image below. The end of the primary trend is confirmed when the market moves below the previous MC1 point. When the market is bullish, all the high points should arrive on time or late in their position, where as all the low points are expected to arrive early or on time. Thus, when point 11 arrives early in an uptrend, there is a higher probability of an inversion point forming. Similarly, in a bear market, the low points will arrive on time or later in their position whereas all the high points should arrive on time or early. Between two MC2 points there cannot be more than three lower time frame (MC1) highs in a row unless one of them is an inversion point. This means that if there is an inversion point in MC1 cycle then we can have as many as four MC1 highs in a row. When multi-time frame cycles are trending in the same direction, the price movement will be larger and sharper. Between two MC3 points there cannot be more than three lower time frame (MC2) highs in a row unless one of them is an inversion point. There is always a compulsory double inversion in the MC3 cycle. So, if the MC3 point 2 in a previous MC3 cycle is high then obviously because of double inversion MC3 point 2 in a newer MC3 cycle will always be a high as well. There will be no inversion point. There are only 8 matrix points. It is obvious that trades taken in the direction of primary trend (higher cycles) will lead to higher profits and help traders to be more consistent. The video below illustrates the manner in which Market Cycles software can be used in conjunction with the charting tools within the ShareScope trading and investment software to forecast the market behavior. Finding solutions for the cycles and marking the turning point timings on a chart manually can be a difficult and tedious task and as such is suseptible to human error which can be expensive if you get it wrong. The Market Matrix add-on for Sharescope can automate the process as it comes complete with the timings for 15 major markets already built in. These include the S&P-500, DOW, NASDAQ, FTSE-100, CAC, DAX, Nikkei-225, Hang Seng, Gold, Silver, Oil, AUDUSD, EURUSD, GBPUSD and GBPJPY. The add-on software is seamlessly integrated into ShareScope, the fundamental and technical analysis software. One additional major beneft with the ShareScope software package is that it comes complete with data feed, so there is no need to subscribe to an external data feed as well. Also, the databases are downloaded and stored on your computer so you are able to do any analysis even at times when an internet connection may not be available. The easy to handle menu driven software includes Matrix grid templates, Matrix Cycles timings for many markets and Matrix Pivots all in one single package. 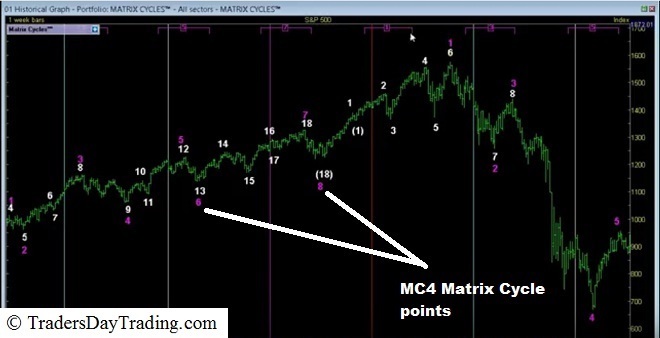 The Matrix Cycle points (MC1, MC2, MC3 and MC4), Matrix Templates and Matrix Pivots can be applied directly on daily, weekly or monthly charts. The Matrix Cycles add-on software has been programmed with information to show Matrix Cycle points, Matrix Templates and Matrix pivots for the next 20 yrs. The Matrix cycles software is a must for those traders and investors who wish to have a clear insight of the ups and downs in a financial market. This add-on software enables a trader to remain stress free and trade the big swings. Please note that the add-on software is priced at a one off cost of GBP 499 and requires a Sharescope Plus or Pro subscription from GBP 40 per month so the whole package is very afordable for most. 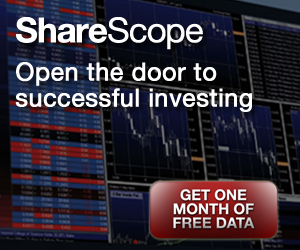 Learn more about ShareScope trading and investment software (one month free special offer discount). For a better understanding of Matrix Cycles and a full explanation of the rules, Steve Copan's book, The Market Matrix priced at GBP 195 is an essental read. Whilst this may seem quite a lot for a book, please remember that it is a trading system that you are buying, not just a book. The e-book explains every detail of the Matrix Cycles. For easy reference, there is a specific page dedicated to each of the individual matrix rules with high quality color charts. Additionally, this 138 page book also has a separate chapter dedicated for Fibonacci and LUCAS numbers. The chapter also explains the link between the Matrix points and the Fibonacci / LUCAS numbers. Another special chapter has been dedicated to the use of Elliott wave theory alongside the Matrix cycles. Not only the wave structures and patterns are discussed with color charts, but also the influence of certain waves on special matrix rules. Finally, there is also a chapter which teaches a simple trading system using the MC1 and MC2 cycles, for beginners to apply and start generating profits from the market.